Snelling ranked among top staffing firms in the United States on prestigious industry list recognizing exceptional service to clients. Dallas, for the 3rd year in a row – Snelling has been named one of the top staffing firms in the United States, according to the annual Inavero “Best of Staffing” rankings. Presented in partnership with CareerBuilder, the Best of Staffing list provides the only statistically valid, objective, service quality benchmarks in the industry and reveals which staffing agencies are delivering exceptional service to their clients. 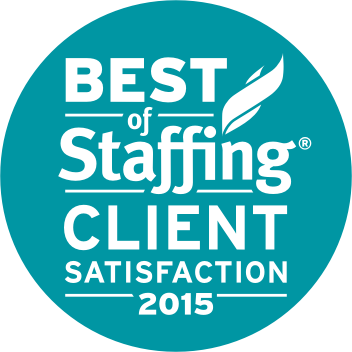 Fewer than 2% of all staffing agencies in the U.S. and Canada earned the 2015 Best of Staffing Award for service excellence. With satisfaction ratings more than three times higher than the industry average, the Best of Staffing winners truly stand out for exceeding expectations. This award identifies the staffing industry’s elite leaders in service quality. “This recognition validates our efforts to drive a focus on customer and candidate quality and service under one way of doing business across the Snelling system. This award provides tangible evidence that working with Snelling is different than working with most other staffing firms – we don’t just say it, we do it,” said Snelling’s president and CEO. Snelling received satisfaction ratings of 9 or 10 out of 10 from 67 percent of its clients, significantly higher than the industry’s average of 39 percent. Inavero (www.inavero.com) administers more staffing agency client and talent satisfaction surveys than any other firm in the world. Inavero’s team reports on satisfaction surveys from more than 500,000 staffing agency clients and talent each year and the company serves as the American Staffing Association’s exclusive research partner. Inavero’s Best of Staffing is the nation’s only award that recognizes staffing agencies that receive remarkable reviews from their clients and the people they help find jobs (employed talent). The Best of Staffing winner lists are a central place that businesses and talent go to find the best staffing agencies to call when they are in need. More details at www.bestofstaffing.com. Snelling is a full-service, WBENC-certified talent management and job placement firm serving temporary, temp-to-hire, contract and direct-hire staffing needs. Since opening its first office in 1951 in Pennsylvania, Snelling has grown to 121 office locations throughout the United States and annual revenue of $320 million. Snelling is committed to helping businesses, candidates and communities prosper by creating successful employment connections. For more information, visit www.snelling.com.